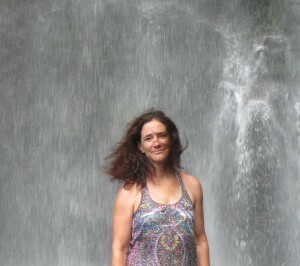 My time in Hana was a gift. A big, beautiful birthday gift to me. I turned 55. That makes it sound sort of like my odometer rolled over (do you watch yours when it nears repeated digits, too?). I guess my odometer did roll over. I’ve traveled a lot of miles in my life. Or maybe it’s a pedometer. You know, the kind that measures your mileage on foot. That would make more sense, since I have two of those. On Saturday, I hiked the two miles up the side of Haleakala, the dormant volcano on Maui, to Waimoku falls, which fall from 400 ft above. Saturday morning was rainy on and off. The following evening we’d had a long steady rain, so the trail was exceedingly wet…and muddy. I forgot to bring my tennis shoes, so I was wearing my thongs. As I trudged up the hill, I could feel things getting more slippery along the way. I found myself trying to stay ‘clean’. Big smile, because after the fact, I can now see how futile this was! At the top, just prior to the falls, you have to cross two parts of the creek/river. This didn’t sound like fun in thongs, so I took them off and proceeded barefoot, making sure to put the thongs back on across the way. On my way back down the hill, I was still trying to walk in my thongs, but it was more slippery by now because the rain had been falling for a bit. Just as I was feeling frustrated with myself and the mud, a group of people going up the hill came into view. One of them was a teenaged girl. She was barefoot. She took one look at me and said, with a smile, “Why don’t you just take them off? 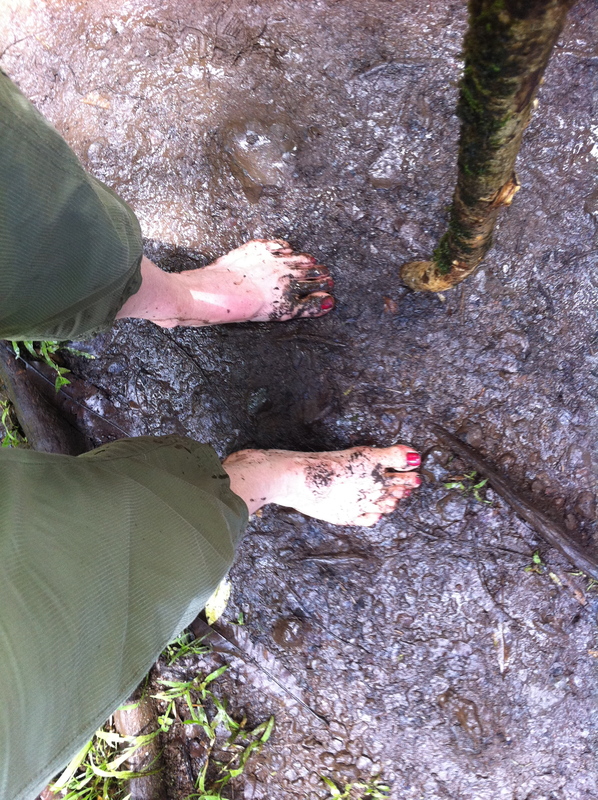 I did.” I looked down at her feet and, sure enough, bare feet covered in mud. I thought about it for a moment, and realized I’d been not fully present to everything around me because I was afraid of slipping and gettingdirty. Here I was in this glorious place and my attention was more on walking than on my surroundings. So I took them off and walked barefoot. The mud was warm and squishy. Why had I been avoiding this? I felt connected. I was aware. I enjoyed it so much more. I had a deeper sensual experience through my feet. It was so freeing because by taking off my shoes, I stepped right into what I had been trying to avoid…getting dirty. Suddenly there was nothing to avoid anymore. Why was I trying so hard to avoid the mud? A similar thing had happened back in January as I hiked in Tilden park. The paths get very muddy there in the winter and spring months, and I would try to keep my running shoes from getting muddy. One day in particular, I was trying to get through a patch of mud and slipped right into it. Once I was dirty, it didn’t matter anymore. I felt lighter, more free and enjoyed the walk much more. I had realized the same thing on my first full day in Hana. I was swimming at Hamoa beach. My towel and bag were on the sand. It began to rain quite hard. I noticed many of the people there rushing out of the water to get their things and carry them to a dryer place under the trees. I decided to get out and attempt to do the same. We were all trying to keep our stuff dry. 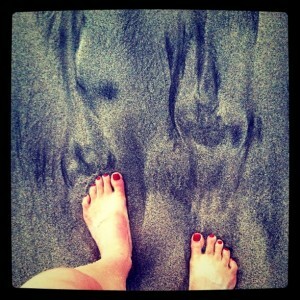 When the rain subsided, we went back to the beach, laid it all out again and went back in the water. Sure enough, back came the rain. Here I was in the water all wet, and I was worried about keeping my stuff dry. I thought about it and realized there was nothing in my stuff that couldn’t get wet. So I gave up trying. I continued to swim and it was quite an amazing experience being in the warm pouring rain while swimming in the warm ocean. When I did decide to return to my bungalow, I gathered my things and put on my hat and it began to rain again. My hat was dripping wet, my cover up was dripping wet. My towel was dripping wet. I was dripping wet. Everything was wet. There was no longer anything to keep dry, and it was incredibly liberating. Nothing was getting hurt by getting wet. In both cases, I let go and relaxed more deeply and immediately into my surroundings. I was more in tune with the sensual nature of the experience itself, and not surprisingly, with my own sensual nature. Without the worrying brain spinning fast, I was available to notice and feel what was immediately present…and the most noticeable thing was freedom, with a gentle joy following closely behind freedom’s feet. I’ve been contemplating this in my life and wondered how often I hold back on doing things completely for fear of getting wet or muddy (either literally or metaphorically). Where do I fear jumping in because it might get messy? How much less awareness is available when much of my awareness is focused on my worry or fears? I can now feel how liberating it would be to let go this way in everyday life. Most of our fears are not really fears of immediate danger. They’re more like fears of avoiding things we’ve been conditioned to fear experiencing…like getting too muddy or getting our things wet, lost, broken, stolen, etc. Avoiding messiness is avoiding life. The joy I felt when I let go into what I was already immersed in was so much more real than what I had feared. Life is in the mud, in the wet, in the full-on contact with all that we’re swimming in. When I am in avoidance, I am not living. rediscovering this place of joy is priceless. pedicure is still mighty fine. I am changed by it all. I love that you let yourself get muddy Julie! I always encouraged my kids to get down and dirty as all their stuff washed. I remember when I used to work in an office in Edinburgh and the rain would fall as it inevitably does, I would take my high heel shoes off and go out at lunch time barefoot. So much easier to dry my feet than the shoes! Before that when I worked outside in a rainy summer, I always wore my shorts and wellies for the same reason, I could dry my legs but jeans took forever. There’s no point fighting nature. let go, enjoy it and wash up afterwards. After living in Hawaii for the past 7 years, I must now ask myself from my Chicago home…was that life or is this? In a short 7 year period of time I became a Grandmother for the first. I now have 2 grandsons. I began a new profession as a professional photographer all stemming from all the baby photos I took of my first grandson back 7 years ago with a floppy drive instead of a chipped card. How photography has evolved in the past 7 years and so have I for that matter. rediscovering the joy is priceless. the metaphors in this writing – have set a spark in me. Happy Birthday! I turned 55 in May, & was in a funk – all necessary to my journey – You have helped me see these double digits with new eyes. 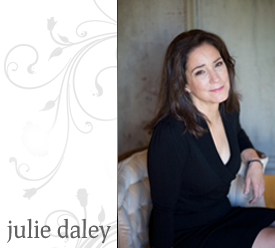 quite simply and profoundly, I love you, Julie Daley and give thanks for the gifts you bring to this world. I had to laugh at your acknowledgement of the pedicure’s awesomeness and staying power–there’s a lesson there somewhere, I think! Beautiful post. you look and are stunningly gorgeous, julie. i love this post more than you can imagine. i just turned 40, and after decades of hiding, contracting and diminishing myself (what i have been swimming in), i recently let go for a moment. during a sacred circle ceremony, i let my voice be heard and my soul self be seen. i roared. loudly. over and over again. opening and releasing all of the knots in my inner geography. allowing my truth to be freed, if only for one moment. happy birthday to you, dear and kindred soul. Julie Julie Julie! My favourite post here so far. Enjoyed every word and love the questions you ask at the end. I often think about these things too and just wrote a post to be published tomorrow that’s related to some of those questions (Devacoaching). I hope you’ll read it : ) Thank you for sharing your gorgeous experience of earth’s natural beauty, the connection you felt, and the questions that came up. Great stuff! I think of: dashing through sprinklers at the end of a long run (because I’m sweaty/wet already anyway), and that time when a bunch of us all washed each other’s hair in a lake at summer camp…a spontaneous, playful time in which getting soapy and soaked was exactly the right idea. happy birthday messy muddy friend. 🙂 Beautiful post. And an inspiration for my 55th next year. This whole last year I’ve been messy, muddy and wet, and yet there have been many times I’ve wanted to clean it all up, stay safe and dry. Every time I try, there is more pain. Every time I try, there is more mess. Thank you for putting this so beautifully, for focusing your lens and providing clarity with your words. I know they’ll come back to me often as I turn a corner and walk more uncharted territory. Thank you for a great post, Julie! “Muddy, wet and messy.” This has me recall a fellow, who gave me, in my early fifties, a great compliment, first by prefacing that he was gay and so not hitting on me, and then saying I was juicy and vibrant and how compelling and attractive that is. Albeit on the other side of the continuum, but for me, all about our organic, naturally divine and wild essence. Happy, happy birthday to you, dear Julie. Happy birthday, Julie! I love nothing more than going out into the pouring rain (if it’s warm out, that is). I’ll change into my running clothes and go for a run, jumping in and over puddles. It’s such a liberating experience. Now I have a lot to think about, because I know I don’t approach all of my life with the same abandon.